This is my eleventh post about autopsies following my first, second, third, fourth, fifth, sixth, seventh, eighth, ninth, and tenth posts. There were ostensibly three pieces of evidence that Hae Min Lee was attacked in her Nissan Sentra. The first piece of evidence was the "broken" windshield wiper or turn signal lever, which I will again address in my post about conclusion #4. 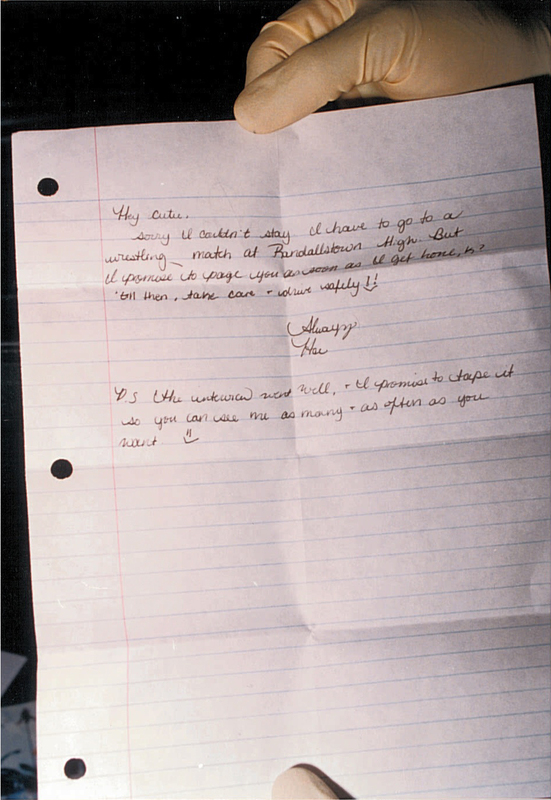 The second piece of evidence was used to be Hae's note to Don about having to attend the Randallstown wrestling match, which was found in the trunk of her Sentra; in the absence of evidence to the contrary, however, the note has now been debunked* as a note written on January 13, 1999, the day of Hae's disappearance, making it irrelevant for this purpose..
That leaves the third piece of evidence: the bloody t-shirt. What is a Pulmonary Edema? In most cases, heart problems cause pulmonary edema. But fluid can accumulate for other reasons, including pneumonia, exposure to certain toxins and medications, trauma to the chest wall, and exercising or living at high elevations. What Testimony Regarding Pulmonary Edemas Was Presented at Trial? On day two of trial, Lee's brother identified State's Exhibit 13 as three photographs of his former t-shirt that his sister had been using as a a cloth/rag to "wipe off windshields and stuff like that." (pages 34-35). One of the photographs that he identified showed the t-shirt in or around the driver's seat of his sister's Sentra, where it was recovered. On day five of trial, Sal Bianca of the Trace Analysis Unit testified as a witness for the prosecution. Bianca identified State's Exhibit 26 as the t-shirt recovered from the Sentra. (page 109). According to Bianca, upon being shown the t-shirt, he noticed "some red stains on it" that he tested and determined to be human blood. (page 109). Bianca also thought there might be nasal mucous on the front right of the t-shirt, but he never submitted this fluid for testing. (pages 135-137). On day six of trial, forensic chemist Theresa Long testified for the prosecution. According to Long, a DNA analysis of the t-shirt was done, which (1) excluded Adnan and Jay as possible donors for the blood stains on the t-shirt; and (2) showed that Lee had a DNA profile that "matched" the DNA profile from the blood samples on the t-shirt, making it a near statistical certainty that the blood on the t-shirt was her blood. (page 20). •Dr. Korell couldn't say with 100% certainty that the fluid on the t-shirt was consistent with a pulmonary edema, but the light pink color of the stains was "consistent with pulmonary edema." (page 67). •In response to being told that Bianca determined that the stains on the t-shirt were blood stains, Dr. Korell responded that "pulmonary edema has red blood cells, and he may, this person may call it blood, yes." (page 67). What Should We Think About the Pulmonary Edema Evidence & Testimony? First, and this is obvious, Dr. Korell was incorrect in her testimony when she said that she found an "extreme amount of bloody fluid" during her autopsy of Lee. Quite clearly, the autopsy report states that "[t]he pulmonary parenchyma was deep purple, exuding moderate amounts of bloody fluid." (emphasis added). This is a significant misstatement that defense counsel failed to catch and that the jurors might not have realized unless they pored over the autopsy report. Simply put, an extreme amount of bloody fluid is much more consistent with pulmonary edema and possibly sputum than a moderate amount of bloody fluid. In fairness, though, a moderate amount of bloody fluid can support a finding of pulmonary edema if combined with other evidence. The upper airway was clear of debris and foreign material; the mucosal surfaces were smooth, had scattered erythema with yellow mucus in branching airways. The pleural surfaces had posterior adhesions with scattered bullae that were up to 5 cm. The pulmonary parenchyma was red-purple, exuding slight to moderate amounts of frothy edema; the right middle lobe was focally firm and had dark discoloration. The pulmonary arteries were normally developed, patent and without thrombus or embolus. The right lung weighed 610 grams; the left 490 grams. The positive findings at autopsy were primarily those seen in the lungs. It was noted that there was frothy fluid present in the trachea, the lungs were hyper-inflated and met anteriorly in the mid-line of the chest after removal of the chest plate, and there was pulmonary edema noted. most reports don’t indicate pulmonary edema unless it's obvious by the dried foaming around the mouth and it is a lot. By the time the autopsy starts they would indicate the amounts of fluid found since they are no longer circulating through the body and settle in the organs. They could not state specifically it was pulmonary edema without the physical evidence to prove it and that is usually gone by the time the body gets to them. Third, the autopsy, on page 6 of 9, reports that the pulmonary parenchyma is red-purple and exudes moderate amounts of blood and frothy fluid. This finding may indicate the presence of pulmonary edema, which is defined as a collection of fluid in the alveolar airways of the lungs. However, there are multiple factors in the autopsy report that do not support the diagnosis of pulmonary edema. There are three things that would cause this much pulmonary edema which, normally most common, is heart failure, because congestive heart failure is pulmonary edema, and the most common cause of death, probably, in all of us; second, drowning; third, would be drug overdose. This is roughly consistent with what I was told by my medical examiner: "unless [Lee] was OD’ing on drugs, or drowned you will not see the pulmonary edema happening." On occasion, in cases of manual strangulation, pulmonary edema is present, with foamy edema fluid visible in the nostrils. pulmonary edema can occur, but this is generally only seen in hanging victims who remain comatose after emergency department arrival. This feeds into my fifth point, which you can probably infer from some of the prior material, such as the mention of pulmonary edema possibly occurring "in hanging victims who remain comatose after emergency department arrival." According to my medical examiner. If she had been transferred to the trunk on her side than possibly after 5-7 hours she could have started to ooze fluids from her mouth but they would be brownish since the body is not pumping fresh blood. If it was really warm out than you would see the fluids leak earlier. Since there was no forensic evidence in the trunk of Hae's car, she could have only been there for a very short period of time. Q. Would you also agree that you frequently will see pink frothy material coming from the lungs in a patient who has pulmonary edema? A. You can, it's not that common. It's written about more than it's actually seen. Dr. Korell then laid a foundation for her testimony by (1) testifying that pulmonary edema fluid is often light pink in color but can be darker if the capillaries break; and (2) claiming that the stains of the t-shirt were light pink. And...that was it. The judge found that a foundation was laid despite the fact that Dr. Korell never tested the t-shirt and only saw photographs of the t-shirt that Bianca described as having "red stains." I do not know of any test to reliably say a stain on clothing is, in fact, due to pulmonary edema. Of course, this all assumes that the stains were in fact light pink, despite the contrary description given by Bianca. My medical examiner said it would be unlikely that pulmonary edema fluid would have still been light pink a month after Lee was killed because stains tend to darken. He thought that a much more plausible explanation for light pink staining, assuming it was present, could be "that the shirt had blood on it and it was washed out without the stains being completely removed and it is used as a rag." 1. Pulmonary edemas are rare in any case. 2. Pulmonary edemas are even rarer in strangulation cases and rarer still in strangulation cases not involving hanging. 3. Even in cases of pulmonary edemas, pink frothy sputum is rare, and it is even rarer for it to come out of the mouth and/or nose. 4. If sputum did come out of a victim's mouth or nose as the result of strangulation, it would not come out until hours later. 5. There was no finding of a pulmonary edema in Lee's autopsy report, and pulmonary edemas are noted when found. 6. The Assistant Medical Examiner misstated the circumstantial evidence of Lee having a pulmonary edema in a significant way. 7. A pulmonary edema cannot be detected from looking at a (photograph of) a stain. 8. Dr. Korell should not have been allowed to offer testimony about pulmonary edemas. 9. The State's case was a "disgrace." 10. The t-shirt can almost certainly be eliminated as evidence that Lee was attacked in her Sentra. *For what it's worthy, Susan Simpson and I each independently reached the conclusion that Lee's note to Don was written on the date of the Randallstown wrestling match (1/5/99), with Lee subsequently deciding to skip the match and see Don. It will be interesting to see whether this conclusion is confirmed or dispelled by additional evidence. I've been thinking about the wrestling match information for a few days, and, eventually, I landed back on my post about the most logical scenarios for Lee's death. Now, the only reliable witness who saw Lee after school on January 1, 1999 is Becky, who remembers Lee telling Adnan that she couldn't give Adnan a ride because she had "something else" to do. As I've noted before, it's likely that this "something else" was something that Lee had to do before picking up her cousin, meaning that Lee likely left Woodlawn soon after the final bell at 2:15. Unless new information about a Woodlawn wrestling match on January 13, 1999 emerges, this looks like an even likelier scenario. This both makes Asia McClain more important as a factual (as opposed to a simply legal) alibi witness and increases the likelihood that Lee died while doing an unknown "something else" (the wrestling match having been ruled out for the moment). Of course, I'm fully open to the possibility that there was some type of Woodlawn wrestling match on January 13, 1999, but I haven't seen any evidence of it...yet. **I also cited Rollins because it was the only case I could find in which a finding of a pulmonary edema was tied to an alleged death by asphyxiation. If you look at the case, you can see that there was a pretty big dispute over whether this conclusion was correct or even admissible, with other things such as cardiovascular disease possibly causing the edema. Why does a note in the car mean that she was attacked in the car? What is the logic in making that claim? I don't think there is a huge amount of logic in it, which shows the weakness of the State's claim that Lee was attacked in her car, given that it was 1 of only 3 pieces of evidence arguably supporting the claim. Ostensibly, the argument is that Hae had the note on her or in the passenger compartment of the car when she was attacked, which is what led to it being put in the trunk when her body was put in the trunk. "10. The t-shirt can almost certainly be eliminated as evidence that Lee was attacked in her Sentra." I don't see how you reach this conclusion from what you have posted. Wow. This is truly unbelievable!!! I smell judicial misconduct...will you be addressing that possibility soon? I don't understand the interest in the t-shirt. The prosecution had a body and they had medical examiner testimony of strangulation. The blood on the shirt tested as belonging to Hae, so why the interest in the t-shirt? Fascinating research re the pulmonary edema/shirt. This was a huge mess-up by the ME/Judge/Defense; Although CG did try to exclude. Still not convinced that a wrestling match did not take place on 1/13th. Just because it's not reported in a newspaper means nothing factually; maybe someone forgot to send in the results or any other number of scenarios. Possibly a junior match that does not get results published; possibly went to press and those numbers were overlooked. Latter scenario, very possible. Summer's vivid recollections of speaking with Hae and her anger at Hae for not showing at the match seems like a vivid and credible memory, in MHO. 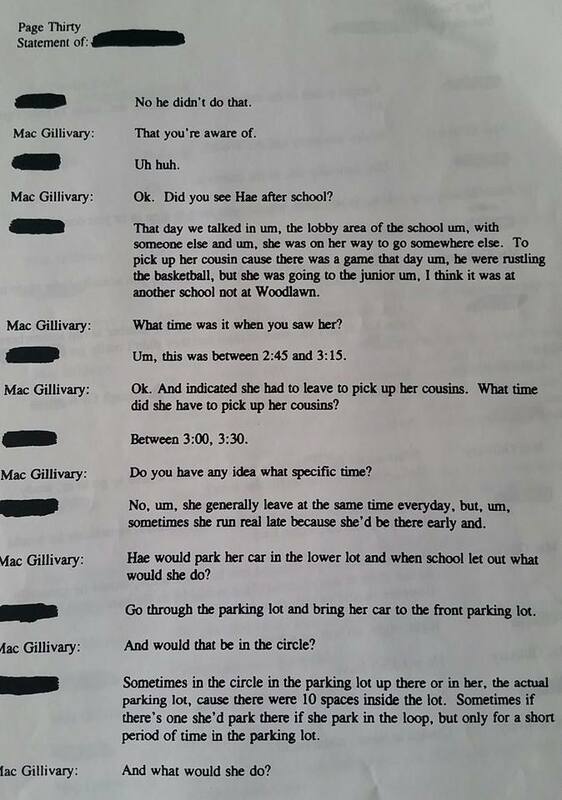 If the HML no-show occurred the week before, Summer would have seen her at school the next day or so and likely held a discussion with with HML about being hung out to dry, and the 13th would not have been as memorable for her. Just MHO. SH: Conclusion #10 is based on conclusions 1-9. Anon II: If the stains on the t-shirt were from a pulmonary edema, it is likely Lee was killed in her Sentra. If not, she easily could have been attacked outside the Sentra. Badger: The wrestling stuff is still developing. As I noted in my post, I'm open to other possibilities. We'll see. This entire post means NOTHING. I am a cardiologist. I see pulmonary edema every day, in living patients. This guy's entire post comes down to "pulmonary edema isn't that common in strangulation, and there wasn't a lot of evidence for it on autopsy, so the medical examiner shouldn't have speculated that the pink frothy stuff on the rag was pulmonary edema from Hae." Even if we fully accept this premise, the question then becomes: so what was the pink frothy stuff that had a DNA match for Hae? Well, there's basically a million things this could be, and none of them really help us figure out who murdered her (e.g. maybe she had a runny nose and wiped it on the rag, maybe she bit her tongue in the fight and the killer wiped it on the rag, etc.). The other question, which is what I assume he's getting at, is was Hae actually strangled? But we already know from the other parts of the autopsy that she was strangled. So basically, all this post does is call out the medical examiner for speculating about a the origin of the frothy substance. Tacock: You say "Well, there's basically a million things [the stains] could be, and none of them really help us figure out who murdered her" and "So basically, all this post does is call out the medical examiner for speculating about a the origin of the frothy substance." Yes, those are exactly the points of the post. Exactly. The shirt can't PROVE anything, and yet the state used it as evidence, using questionable testimony that also essentially meant nothing. Late edition: It seems almost a certantity that there was a wrestling match on the night in question and that HML was scheduled to attend. Most likely a junior match. Three people—two students and a staff member are on record as making statements to this effect. Two of them to police, and one, Summer, to SK. FWIW it appears that the staff member's statements are the least reliable, as some of the details change over time. Still, I doubt three people are confused about this particular date. Someone has posted a link on Simpson's site to Debbie's interview with a detective, originally posted by Rabia . 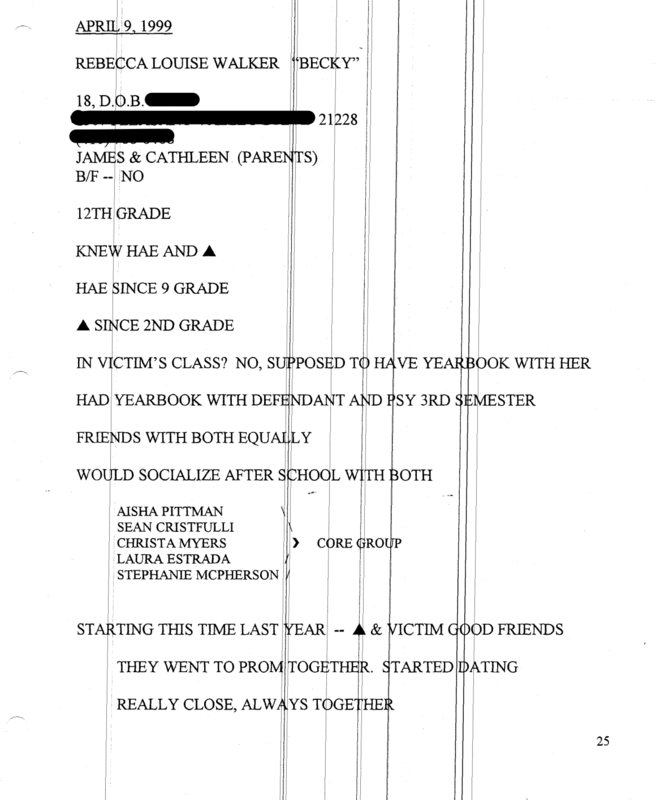 Debbie's name is redacted, but was later revealed. I am also a physician and I think the point of this post, Tacock, is that the material on the shirt was neither pink nor frothy but rather merely had Hae's blood in it. As you state, this could have come from any source, least likely of which is pulmonary edema. Also, these posts help to break down every element of the state's case which is crucial from a legal perspective, particularly since Adnan has an active appeal. Tacock, read all of Colin Miller's other posts. These posts are on a quest to find the truth which I think you would appreciate. Badger: Debbie recanted her statement at trial, which is how the State was able to advance its theory that Hae was dead by 2:36. The testimony regarding this particular piece of evidence seems pretty speculative. It boggles my mind that the state would present it and that the defense wouldn't have had a bigger problem with it since it would appear that no one knows what the stain actually is. How does one conclude, by looking at a shirt, that a pink or red stain was caused by foam/froth at all? I would imagine that to arrive at the conclusion about the consistency of the substance that caused a stain, there would be more to describe about it than it's color. Additionally, though DNA testing was performed, it does not appear that there was any testing done to determine exactly what the stain was comprised of (a mixture of blood, saliva, mucous, etc). Nice work again Colin. I'm also so glad that who ever killed her was so neat and tidy that absolutely no other blood stains were found...anywhere. But waving around a t-shirt that may or may not have someones blood on it is so important to convicting someone for murder. Thanks Professor, I know she changed her sighting time of HML after speaking with detectives and the 'infamous' tape change, but I didn't know she'd recanted her testimony at trial. Hey Prof I wish I'd read this before my latest spat!